The quarter-finals completed, the semi-finalists known and so are the names of the countries that will compete in the Men’s Singles final at the 2018 ITTF World Tour Asarel Bulgaria Open in Panagyurishte. 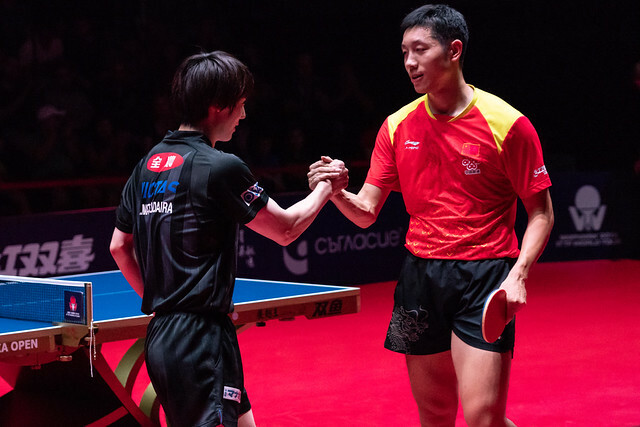 On Saturday 18th August, in the top half of the draw, China’s Kenta Matsudaira and Tomokazu Harimoto emerged successful: in the lower half China’s Ma Te and Xu Xin prevailed. Success for Japan and hard earned success; Kenta Matsudaira, the no.7 seed, the runner up last year and in 2015, needed the full seven games to beat Chinese qualifier Zheng Peifeng (11-6, 7-11, 13-11, 11-9, 10-12, 7-11, 11-3) in what was their first ever meeting on international soil. Similarly, in the battle of the generations, Tomakazu Harimoto, the no.5 seed, eventually overcame Vladimir Samsonov of Belarus, the no.10 seed, in six games (11-4, 11-8, 9-11, 3-11, 11-6, 11-5) and thus maintained the ascendancy over his illustrious adversary. It is now three matches played on the international scene, three wins for youth. Last year Tomokazu Harimoto emerged successful on the Seamaster 2017 ITTF World Tour in the Korea Republic and earlier this year at the Liebherr 2018 World Team Championships in Halmstad. The only difference was that in Panagyurishte, the contest did not go the full distance. Meanwhile, in the lower half of the draw, the defensive skills and the fearsome forehand attacking strokes of Ma Te, reminiscent of Chinese predecessors Chen Xinhua, Ding Song and Hou Yingchao, proved too great for Austria’s Daniel Habesohn; a straight games win was the victory margin (11-9, 11-3, 11-8, 11-4). Success in straight games for Ma Te in what was his first ever meeting with Daniel Habesohn in a world ranking event; it was the same for Xu Xin in his fifth such clash against Japan’s Koki Niwa. Xu Xin prevailed in some style (11-1, 11-6, 11-9, 11-7) and thus laid to rest recent defeats. In 2010 at the Asian Cup in Guangzhou and three years later on the ITTF World Tour in the Korea Republic, Xu Xin had prevailed; but more recently at the 2015 Asian Cup in Jaipur and at the Seamaster 2017 Asian Championships in Wuxi, the decision had gone in favour of Koki Niwa. In Panagyurishte, Xu Xin set the record straight; the semi-finals will be played later in the day in the evening session of play.